With the 2017 release of the new The Mummy movie, slots based on ancient Egypt are having a veritable renaissance amongst online casino players. Your options are endless, with titles like the Riches of Ra online slot doing battle with the likes of Rabcat's River of Riches. If you're stuck deciding which Egyptian video slot to get your teeth into, read our full slot review guide to help you decide. C$1000 Welcome Bonus + 50 Extra Spins! You don't have to go to Vegas to enjoy the thrills of roulette or the excitement of slot games. At Vegas Hero, you'll find everything you need! Vegas Casino made its introduction in 2015, aiming to offer a casino experience on par with the fun and thrills of Las Vegas itself. A recent revamp in 2018 has seen a new design, more games and improved payment options. Arcade fruit machines have traditionally loved the Egyptian theme, and the Riches of Ra slot, developed by Play'n GO, certainly proves there's life in the old dog yet. Join Ra, the god of the sun who was devoured by the moon and is re-birthed as a phoenix each morning (and to think you moan about your nine to five!) and win big along the way. Riches of Ra has a distinct 90's arcade video slot look and feel, with overlapping reels and backgrounds featuring the Giza pyramids at sunset, the mighty Sphinx and plenty of hieroglyphics. The reels themselves spin with basic audio effects, paying for symbol combo's including the Phoenix, Tutankhamen, Scarab beetle, Ankh cross, A, K, Q, J and 10. The Wild falcon mask of Ra supplements your spins with extra win potential, while the sacred vases trigger the bonus reward game. 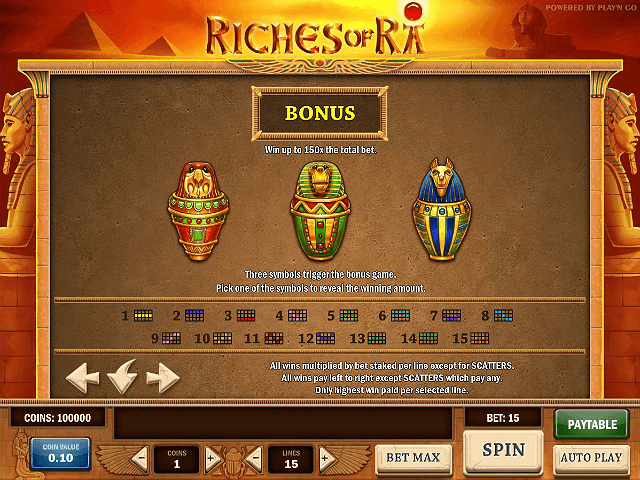 Riches of Ra has RTG levels of 94% with plenty of scope for payouts. 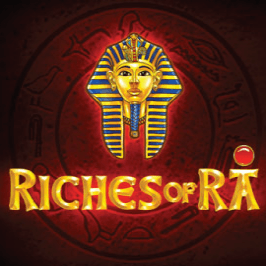 Riches of Ra has bet levels from 0.01 to 75.00, with a large variety of small, medium and large payouts for winning base game combinations – plus bonus rewards which can significantly enhance prizes. Five Tutankhamen symbols payout a huge 2500x your spin, while other prizes range from 10x to 500x for five Phoenix symbols. 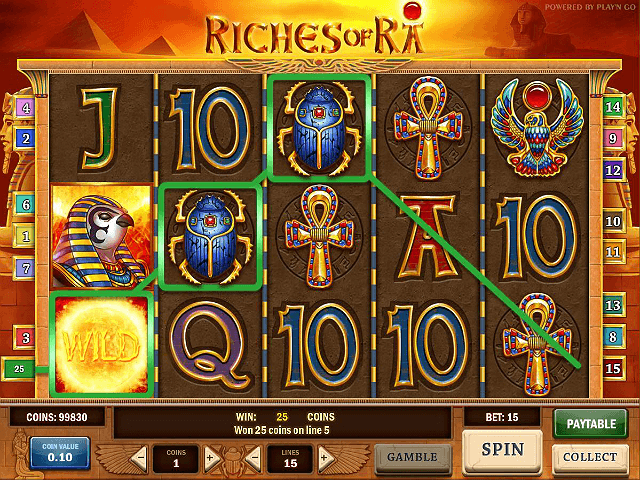 Like many games, Riches of Ra online slot contains a gamble feature with a 'guess the card' game. You can play-up winning spins and gamble one to five times – potentially massively compounding your prize. However, losing any gamble leaves you with nothing! The most powerful element of bonuses offered by the Riches of Ra video slot comes to you virtue of the Falcon Headed Ra Wild symbol. Match icons to fully cover reels one and five to pocket 15 free spins. During free spins, the wild is frozen to enhance the odds of winning combinations. Landing three sacred urns on the reels triggers the scratch card style pick a prize feature. Here, you're whisked away into a secret room and given the choice to win the cash prize inside one of three vases. You can win payouts over 10000 depending on you bet size. Sure – it's pure luck, but adds some variety to the game. 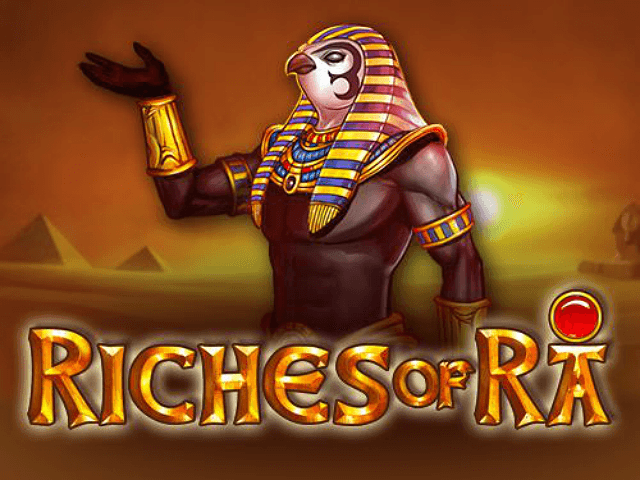 Riches of Ra online slot might be just one more in the host of ancient Egyptian themed slots, but it sure does deliver that classic arcade feel, a riveting narrative, and simple yet rewarding bonuses. 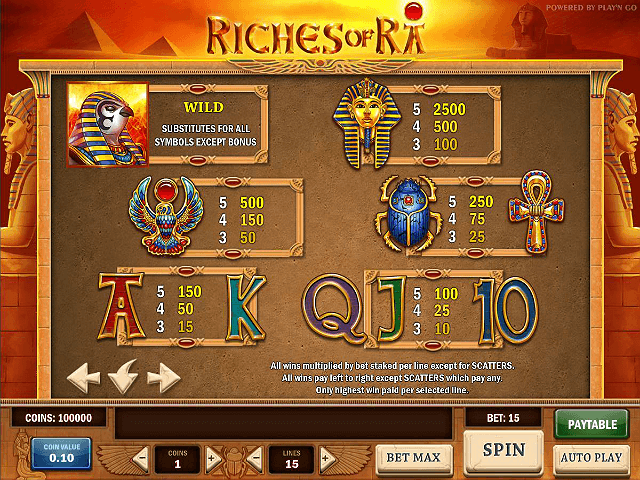 If you like Riches of Ra - You'll like these slots too!